This week we’re off to Paris, France with one of my favourite shots from our trip in 2005. 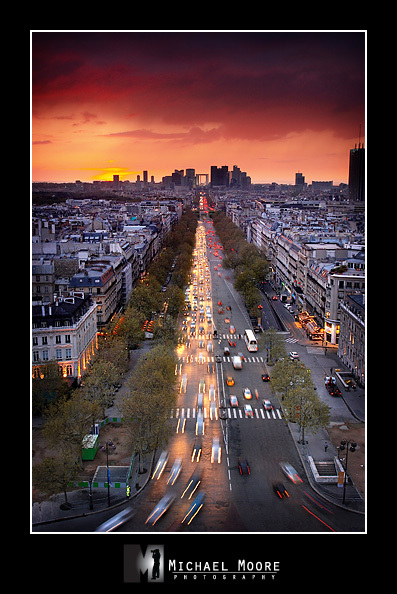 This is a view looking down Avenue De La Grande Armeé from the top of Arc De Triomphe. The view from here at dusk and early evening is breathtaking and you can see almost all of Paris’ famous attractions from The Louvre, Notre Dame, The Pantheon, Eiffel Tower, Sacre-Coeur and more. This was a combination of two photos – one long exposure to capture the light streaks from the cars and a shorter exposure to capture the city sharply (they wouldn’t allow tripods up there so it was quite tricky to get a sharp image).